The first week of training held in Barcelona had accustomed Ondrej and I too well, especially regarding the weather: upon our arrival here in Dublin, we immediately had the pleasure of experiencing the Irish climate (especially the rain!). 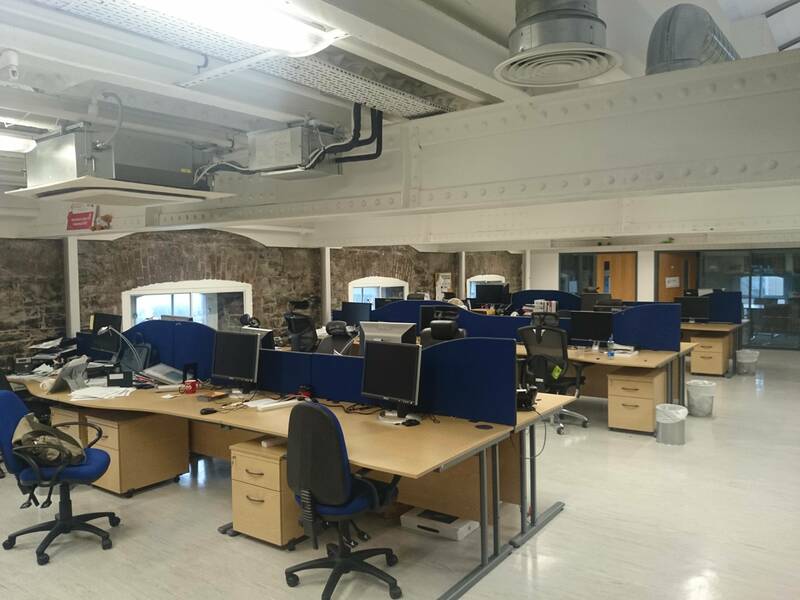 However this didn’t discourage us and, with a quick pace, we went to our workplace, the ICHEC HPC Hub, an office on the 7th Floor of the Tower Building, Trinity Technology & Enterprise Centre in Grand Canal Quay. Ondrej and I were greeted by our coordinator Dr. Simon Wong who, after showing us our working stations, introduced us to all the other staff, making us feel immediately welcome. I was able, in particular, to get to know my mentor Dr. Adam Ralph, with whom I was able to exchange a few opinions about my project. In the coming weeks I will work to try to extend the DL_POLY_4 molecular dynamics software package to enable, respectively, 2D and 3D visualizations of molecular simulations in real-time. First, I focused on trying to understand what might be the best strategies for connecting the visualization software to DL_POLY_4 and I believed, with my coordinator, that ZeroMQ should be used a connector of languages particularly efficient and light. ICHEC is a reality that this year celebrates its first 10 years and structures primarily on three levels: the Dublin office; the one at Galway, where we went to fill out the paperwork related to our financing and where we met Ondrej’s mentor, Dr. Enda O’Brien; and the supercomputer Fionn, whose name derives from the Irish word “Fionnachtana”, which refers to the action of the discovery, decided after a contest organized among students of Irish primary and secondary school. It allows you to do several jobs, since it has core dedicated to the development, for graphics operations and so on, allowing you to achieve a peak performance of 147.5 TFlop via InfiniBand connection, with a storage of 560 TB and a total memory of 23.7 TB. SoHPC for me is not just about HPC: indeed over the weekend Ondrej and I could see some landscapes and some views that really impressed me. Through Ireland and its streets, more or less wide, not far from Dublin you can see either the Wicklow National Park surrounded by mountains or picturesque lakes like those of Glendalough or again historical destinations as far as the medieval period Kilkenny; without forgetting the beautiful east coast beaches of Curracloe and Wexford. In the immediate vicinity of Dublin, we could enjoyed Howth, a small fishing village still untouched in its simplicity, and Malahide, which with its castle and its garden, lets you to enjoy a few hours of peace, away from the city and its turmoil.